This is a website about baseball and numbers. Baseball numbers. BaseballNumbers! So you would think that we would start a look at Heath Hembree’s 2017 season with his BaseballNumbers©. And we will! To look only at his season’s numbers, you would be impressed by Heath Hembree. He increased his strikeout rate last season to a number well above league average and did it while dropping his walk rate below league average. That is good. Very good and impressive. You are impressed. I congratulate you on being so impressed. A person, maybe even you, might think Hembree looks like an eighth inning guy who could potentially step in should Craig Kimbrel need a rest or, God forbid, hit the DL. Yet, you should not think that because that is a mistaken notion. As much as his numbers might say he is, might scream it from the rooftops or even hire one of those skywriting airplanes to broadcast it to every sun-scorched beachgoer, Hembree isn’t that guy. If he stepped in to Kimbrel’s role — let alone took over eighth inning duties — it would likely be a disaster. Why? Funny you should ask, because that’s sort of what this paragraph is about. It’s really one specific reason only, namely Hembree is lousy against right-handed hitters. Or at least we know he was last season. Over his career which, admittedly isn’t much beyond last season, he’s been… well, it’s harder to say. His career numbers kinda bounce around a bit. Some support the idea he’s been worse against righties and some say he’s been worse against lefties, and it depends on which you look at. On the whole, he was roughly at least similarly mediocre regardless of which side of the plate you faced him from. But last year? Yikes. Double yikes! And last year is more than a fly in the ointment, it’s like a herd of elephants. And this herd doesn’t like ointment. We know so much about baseball now thanks to advanced stats, and coupled with our understanding of things like launch angles and pitch planes and all these other miraculous steps towards true baseball enlightenment, we really can pin stuff down now better than ever before. But one of the things which isn’t yet readily apparent is why some pitchers struggle against some hitters. Or, if you want to get brutal about it, why was Heath Hembree so damn terrible against right-handed hitters last season? Tell me that, StatCast, you righteous jerk! Well, 10 homers in 62 innings is a good amount and I mean “good” as in “bad.” Also, what the hell with righties, man? Hembree had a 4.88 FIP against normal hitters, but held the weirdos to a 1.16 FIP. That’s insane. Against opposite sided hitters he was peak Pedro, but against same-sided hitters — the ones he should have an advantage over — he was flaming hot diapers shooting from an industrial furnace. Look, I’m tired and comparisons aren’t coming easily right now so can we please agree that’s really bad? Thank you. Hembree’s overall effect was meh. 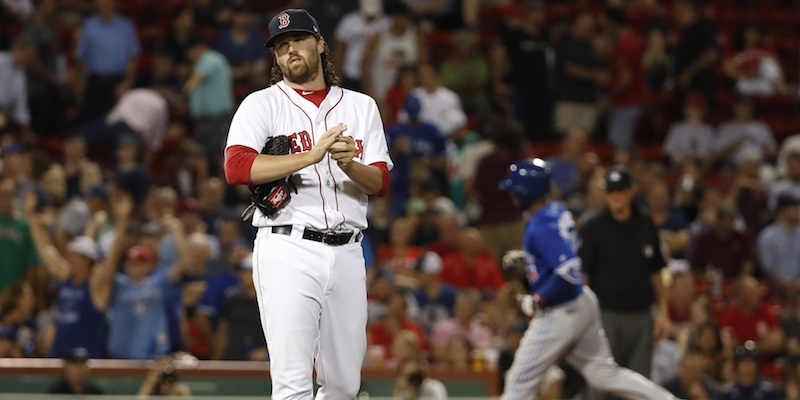 So meh in fact that Hembree, who threw the third-most innings of any Red Sox reliever behind Kimbel and Matt Barnes, was left off the playoff roster. So 2018? Who the heck knows anymore. Relievers are like lottery tickets, even when you already have them on your roster. Would it honestly surprise anyone if Hembree figured out things against right-handed hitters a bit and turned himself into a seventh inning power guy? Or how about if he was hot poo against lefties as well as righties and got himself cut from the roster by June? The truth likely lies somewhere in between, where PECOTA sleeps. But as long as Hembree can’t be counted on to get right-handed hitters out, he’s nothing but a back of the bullpen type, and there’s very little separating him from some dude in Triple-A with a live arm and a major league dream, regardless of how impressive his overall numbers looked at the end of the season. For 2018, expect a guy who gets some Ks and glowers a lot from the mound like a modern-day scary reliever type-dude, but is prone to the occasionally badly timed walk and the always badly timed dinger. Those guys grow on trees now, but, to Hembree’s credit, they don’t all have his beautiful curly locks. Dress for the job you want, not the job you have, right? For now that’ll have to do. Hembree without options looks like a trade candidate (or did I mean Barnes?). Sounds like you should mean Barnes and Hembree. Both have some very good stats but they always seem to give up the key hits. Neither is consistently good. Time to unload.